Over the last few years of teaching ukulele (and 9 years of teaching guitar) I have noticed young beginners in particular struggle to get to grips with reading tab, but it’s sometimes any age. They get confused over which string the top line of the tab is. Usually they think it’s the 4th string at the top of the tab because it’s at the top of their ukulele when they look at it, and they find it hard to get over this being the other way around at first! Also, students often get distracted by other things on the sheet music and often ask questions like; “what does TAB mean”, “do we play 4 4 at the start?”, “what do these notes mean? (pointing to the notes above the tab), or say things like “the numbers are too small”, “I keep getting lost” (again with regards to the numbers being small and getting lost because they have taken a while looking down at their instrument trying to find fret 2 on the 3rd string, for example). So as a teacher I decided to create a range of sheets like this one to make both my life easier and to help my students get to grips with reading tab quicker for playing scales, melodies and exercises. I have created the sheet using Adobe Illustrator. I intend to post more of these sheets and similar ones for playing chord progressions, and I will release one or two ebooks based on these. There are also be guitar ones. On exercise 1, read all 4 strings at once from left to right. You will play in this order: Play the open string (that is the 0) on string 3 and then press down on fret 2 of the 3rd string and then play that string to make the note. Then in a similar way play 0 1 3 on string 2, then 0 2 3 on string 1. Next, do all of this in reverse. Finally, repeat all of this a further 3 times so that you will have been around 4 times in total. Play exercise 2 – 4 in the same way. Related: This sheet is featured in the premium ebook First Ukulele Book – Easy Reading. 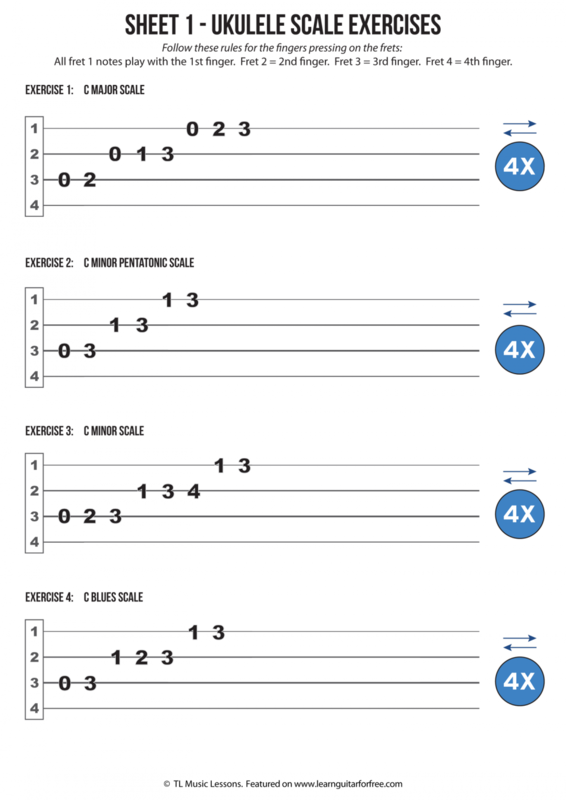 Related: Sheet 1 – Easy Reading Guitar Scale Exercises.